Old School Ghost vs New? So I'm on a minifig kick lately (I'm sure I'm the only one....) and I nabbed the latest glow in the dark ghost to go alongside my old school one. I'm definitely a bigger fan of the 1x2 brick & plate over the pants, anyone else? Is this just about what type of legs the ghost uses? Because both the old and new ghosts exist in both variations. 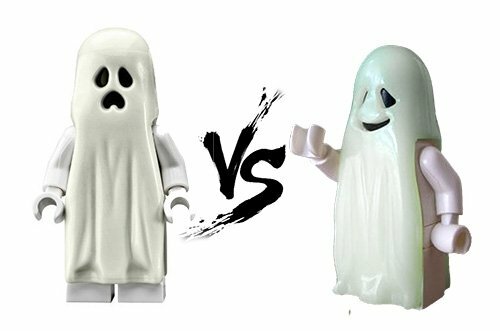 The new style ghost shroud with a brick and plate for legs appeared in two sets (and with a ball and chain in #30201 ), while the old style ghost shroud with actual minifigure legs appeared in three different sets. I think I prefer the version with minifigure legs. The proportions feel better to me when the lights are on, not to mention that if you turn out the lights, the extra height makes the glowing shroud appear to float. I don't have any preference between the old smiling shroud and the new moaning shroud. I think they're good for different things. But I do like the color of the new shrouds better, since it matches the rest of the fig better. @Aanchir has just convinced me that I need all possible ghost variations! I agree the new one has a better color. also it has a better glow, or maybe it's just the other one which is too used? ^^I've always wanted to get them all, I just can't bring myself to spend the money on the rare color variations. @Tkatt ....no!! Now I want those too, why would you do that??? I sadly only have the new ones, but I love the old design with the smile......thankfully I have ghost Vitruvious to help. I prefer the new one, and the type of legs doesn't matter too much as you cannot move them anyway. ^ I disagree. I like the clear shroud- stick it on a stand, put some trans or white bricks in it, and it would look really cool. That's fair. I don't mind the clear shroud on its own; I just think the fig as a whole (with the yellow hands and the black head showing through the shroud) is a weak design. I imagine the designer might not have been too happy with it either. 294 Phosphorescent Green was still fairly new in 2006, so any prototype of the set might have very easily used the original 50 Phosphorescent White. And the yellow hands make me think that white torsos with white hands weren't in production in the time and the set just didn't have the budget to re-introduce them. I agree that the ghost by itself looks pretty bad- the whole set was pretty weird.